PRINCESS BEACHFRONT CONDO-SUPER CLEAN 2-REMODELED-FREE PKG/WiFi/AWESOME VIEW! ALL WORK ON THE RAILS REPLACEMENT PROJECT HAS BEEN COMPLETED. SPECTACULAR 180º OCEAN/SUNSET VIEWS! 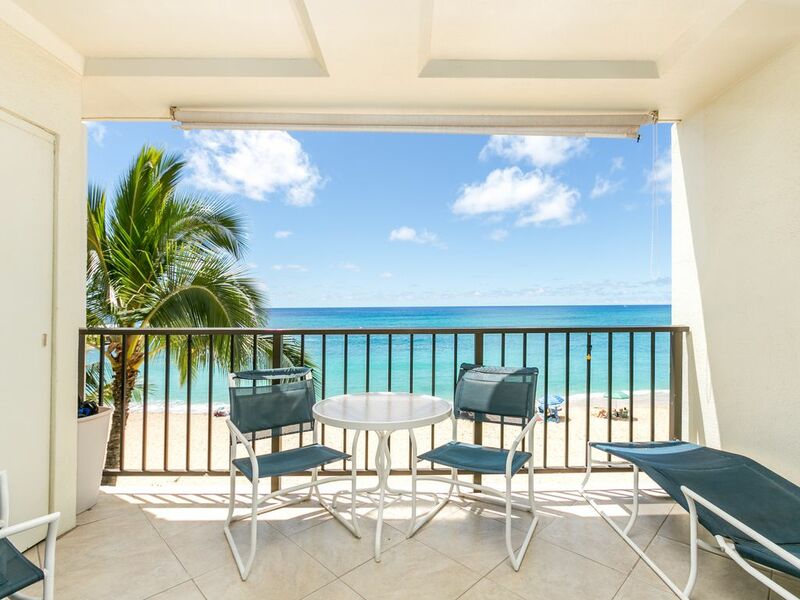 Our condo is DIRECT BEACHFRONT ON DRY, SUNNY LEEWARD COAST OF OAHU AND VERY CONVENIENT TO NEW DISNEY AU'LANI RESORT, KO'OLINA, AND IHI'LANI. Condo has a fully-equipped kitchen with full-size appliances, including icemaker, dishwasher, as well as a washer and dryer in the unit. Condo features two cable TVs, DVDs, 2 Phones with answering machine, ceiling fans, air conditioning (although you won't need it with our wonderful tradewinds), very comfortable KING size bedroom, queen sofabed WITH DREAM TOPPER! in living room just in case you prefer to sleep to the sound of the surf or if there are more than 2 in your party. We also provide a floor futon if the 3rd & 4th guest do not choose to share the sofabed. By request, we can provide a Play 'n Pak and an inflatable mattress if you prefer that rather than the single floor futon (inflatable takes up a lot of floor space, so we don't recommend it). Large lanai with unparalleled ocean and mountain 180º unobstructed OCEAN and SUNSET view! We provide all beach equipment: chairs, umbrella, mat, cooler, boogie boards, and snorkeling gear. Our condo is truly sitting right on the most beautiful, pristine, white sand beach on the Leeward Coast. You may even borrow our kayak! ASK ABOUT OUR LAST-MINUTE DISCOUNT FOR DATES WITHIN 2 WEEKS OF TODAY (HOLIDAYS & Peak Season of Jan/Feb/Mar/Apr EXCLUDED)! DOES NOT APPLY TO ANY KIND OF SPECIAL DISCOUNT DATES WE ARE OFFERING. The condo featured in this ad has been completely remodeled in the best quality and is well-maintained and SUPER clean. YOU WILL NOT FIND A CLEANER OR BETTER MAINTAINED UNIT THAN OURS. E-MAIL US TO FIND OUT IF WE HAVE YOUR DATES OPEN!! PLEASE GIVE US # IN PARTY AND AGES OF ANY CHILDREN. MOST OF OUR BUSINESS IS REPEAT GUESTS--WE ARE DOING IT RIGHT! If you find a COMPARABLE condo at a lesser rate, please let us know the details; we will try to compete. Location is on the beautiful dry, sunny Leeward Coast of Oahu in Makaha. Far from the hustle and bustle, we're in the countryside where you can still experience Hawaii the way it should be--non-touristy, unspoiled and uncrowded. The Aloha Spirit is alive and well in Makaha! This is the PERFECT spot for a romantic getaway, honeymoon, anniversary celebration, or just for some quiet time alone. Watch spectacular sunsets, see the spinner dolphins, sea turtles, and even whales during the annual migration--all from the comfort of your private beachfront lanai. We have an AWESOME beach, the best on Oahu--swim, snorkel, boogie board, surf, or simply enjoy the beautiful beach and aqua ocean with its abundant sea life. World-famous Makaha Surfing Beach (home to international surfing competition) oceanview courses, tennis on the grounds, pool, Jacuzzi, and barbecue. We have several fast-food and ethnic restaurants, plus the Makaha Golf Resort. Upscale shopping and dining are about 20 minutes away. FREE HIGH-SPEED WIRED OR WIRELESS INTERNET.! E-MAIL US FOR ACCURATE AVAILABILITY AND *RATES--YOU WILL BE HAPPY WITH OUR CONDO AND SERVICE! Condo is SMACK DAB ON THE SAND! BEACHFRONT AND SUPERIOR CLEANLINESS. YOU MIGHT SAY WE ARE FANATICS ABOUT PROVIDING A+ STANDARDS OF CLEANLINESS AND MAINTENANCE! You may borrow our one-person kayak. DON'T MISS POLYNESIAN CULTURAL CENTER!! !